A member of the FBI is in the room but we're not sure who or where he is. He probably already knows everything about us. Our phone lines are probably already tapped. We've probably been x-rayed in our sleep. We bet he loves black coffee and cherry pie, too. We keep our eyes peeled for men in suits, but the only men in suits we've encountered all day have been catering staff offering us more bread rolls. We're looking for a man who we are now convinced does not exist. He is here to talk to us about video games. Randy Pargman gets up on stage and introduces himself. He's a member of the FBI, and he works at the FBI Training Academy in Virginia. He's not wearing a black suit, he doesn't constantly interrupt himself to talk into a voice recorder. From what we can see, he doesn't look armed. He looks like an ordinary, friendly guy. He could probably kill us all if he wanted to. The audience consists of Games Connect Asia Pacific attendees who are here to learn of better ways to make games. To widen our minds a bit further, Pargman is here to tell us how games help the FBI create better agents. It almost seems peculiar that an institution as intimidating and high-profile as the US Federal Bureau of Investigation would involve video games at any level of their establishment - after all, aren't games generally considered entertainment? Aren't FBI agents trained by having The Knowledge Of The Law Enforcement Universe zapped straight into their brains in the womb? Perhaps this particular writer has engaged a bit too much with popular culture. According to Pargman, I'm not alone. "When you see in movies like ‘Charlie's Angels' where they make an entry into a room with guns up like this and everyone gets all excited… that's all rubbish," says Pargman, who is responsible for developing the games that the FBI uses to train its new agents. "We have to get rid of the ideas that people have from TV and movies, which is where most people get their FBI information from," he says. "We have to get rid of those perceptions and teach them the safe way to go about a job that is inherently dangerous. And when I say ‘safe', I mean ‘safer', because there is no perfectly safe way to enter a room full of hardened criminals who are armed with weapons who want to kill you." This is where the video games come in - video games made by the FBI, for the FBI. At present, new agent trainees spend 21 weeks training full-time at the FBI Training Academy. During that time, two hours are allocated to training with video games each week. The number of hours will soon be increased to eight. The games they play vary in style and genre, and each of them aim to teach the new agent trainees how to do things safer and better. But what are the trainees learning from Pargman's games? What are the specific skills? According to Pargman, everything needs to be taught from the ground up, and video games supplement the training. Depending on what Congress authorises, the FBI trains 1000 new agents from various backgrounds each year. The agents may be former accountants, lawyers, doctors or engineers from all over America - few of them have an existing law enforcement background - so the FBI cannot assume anything. The new agents are taught skills ranging from investigation to law enforcement to firearms proficiency. The training aims to give them the ability to talk to anyone - from hardened criminals to the CEO of a corporation - in a way that makes them comfortable enough to give the agent information that might lead to a confession. "Most of the agents that are coming in have never fired a gun before," says Pargman. "We have to bring them up to a very high level of proficiency and if they don't meet that, they're gone, because you can't have people who are carrying around firearms in life-threatening situations who can't hit what they're aiming at." Pargman brings up a game on the screen. We see a top-down view of two armed FBI agents walking down a hallway about to enter a room. The objective: to clear the room without getting killed. This is an exercise in tactical room clearing. The room we see is empty - we know there is no immediate threat regardless of how we enter, but that is beside the point. In the real world, an agent will not necessarily know if the room they are entering is empty or filled with hostiles, so they must approach the mission in the safest way possible. So how do we clear this room without receiving a massive fail from the FBI Training Academy? Movies have taught us to either barge in, guns blazing, showering the scene with bullets, or to kick down the door and yell "FREEZE!". Video games have taught us to throw a grenade and obliterate everything for good measure. Pargman tells us that if we do any of those things we are sure to land ourselves in a hell of a lot of trouble. He picks up the Xbox controller and shows us how it's meant to be done. Pargment's in-game FBI agent walks down a hallway towards the room like we would have. But where our instinct would have been to run in and shoot wildly, Pargman strategically makes a sharp turn towards the corners of the room as soon as he enters. The reason? If someone is hiding from you, chances are they won't be sitting right in the middle of the room waiting for you to come and get them. They are most likely to be positioned with their backs against a corner, ready to take you out before you ever have a chance to shout out a an FBI quote from your favourite Hollywood movie. The room collectively "aahhs". Clearly, we are not agent material. Before introducing video games like the one Pargman demoed, the FBI Academy showed videos to the agent trainees. Videos demonstrated actions; trainees took away theoretical knowledge which they would then apply at Hogan's Alley, the FBI Academy's mock town. "We formerly just did straight videos of people performing the techniques, but what we found is that if an instructor puts on a video, dims the light and leaves the room because there's really nothing he can add while the video is running, the trainee agents all fall asleep," he says. Despite their somewhat minor role, since video games' introduction into the FBI curriculum, fewer trainees fall asleep in class. There has also been a noticeable spike in student engagement. Where trainees once left the classrooms for their breaks, they now stick around and play with the games, asking questions about tactics and techniques and showing genuine interest. Hello new-fangled technology! What are you? It's not always easy introducing something new to such an established institution, and the FBI is no exception. "I kept telling them that the simple answer is it's exactly the place where you used to show the video! That's it: you just do this instead of the video, but they still didn't understand." Finally, Pargman offered to go into the classrooms and teach this part of the lesson with the instructor standing next to him. The other problem he encountered was that not every trainee was necessarily a gamer. Many had difficulty getting their heads around the controls. Pargman describes a first-person perspective prototype he created that he then tested with an audience of non-gamer expert law enforcement officers. It was an utter failure. "By ‘failure', I mean they didn't get it at all," he says. "They all wondered where am I? I would tell them ‘You're the camera… it's looking through your eyes', and they would say, ‘Well that doesn't make any sense'. "What I found was - and this is my guess - a lot of them don't play games but they are familiar with movies… how many movies have you seen where the camera is from the first-person perspective? Not many good ones - you don't see it very often. You always see the characters on screen. So that let me think maybe you need a third-person perspective, and the user testing proved that we needed to do that." Pargman spends most of his time user-testing and re-iterating. He comes up with new prototypes every two weeks and offers trainee agents pizza and cookies to come in and test them. He believes that no matter how talented a game designer you are, you cannot make a successful simulation game without user-testing - you can never be certain what people want, how they will play, or what they will enjoy until you put the game in their hands and watch them play. One of the important lessons he learned came from a simulation he developed that encouraged agent trainees to practice their crime scene investigation skills. The scenario in the game goes like this: the player walks up to their superior, who gives them orders. The man's face is a bit flat, as though someone photographed a real person's face and printed it onto a pancake. He's monotonous, delivering all his orders with a thick American accent that borders on irritating. If he were an NPC in an entertainment title, a player would be hitting the "skip" button so hard the controller might break. The reaction from the FBI trainees to this character was not too different from my own. "They absolutely hated him!" says Pargman. "He's boring, he talks for a long time, he just sucked all of the energy out of the whole thing, and something that we found through this is that just because it's a serious game it doesn't mean it has to be seriously dull. It's very important to actually engage the user, otherwise all the valuable information in the game will be lost. We're trying to leverage that experience from the games industry." When a game sets out to be educational, the game can often be lost within the education. Serious games don't have a reputation for being seriously engaging, and Pargman is well aware of that. He joined the FBI at first as a computer science intern, before taking a permanent role later on. He understands what needs to be taught, having undergone the same training himself. He also plays a wide variety of games. He believes that the world of serious games can learn a lot from the entertainment games industry. "It's extremely challenging to make serious games not be seriously dull," he says. "The way we find the fun and user engagement for a serious game is very similar to the way you'd go about it in an entertainment title. Start by studying similar games that are popular and did well, make your best guesses about what parts of the control scheme and game mechanics you should borrow from those versus new designs, then quickly build a prototype to test your ideas and get your prototype into the hands of the players to test it." Pargman says that he loves discovering unique games that make use of different creative controls, mechanics and camera angles. "Lately, I've been playing Flower, Braid, Funky Lab Rat, The 2D Adventures of Rotating Octopus, Echochrome, and Stacking. I have learned a lot about story-telling from Half-Life 2, Heavy Rain, the Uncharted series (I'm playing 3 now), and L.A. Noire." 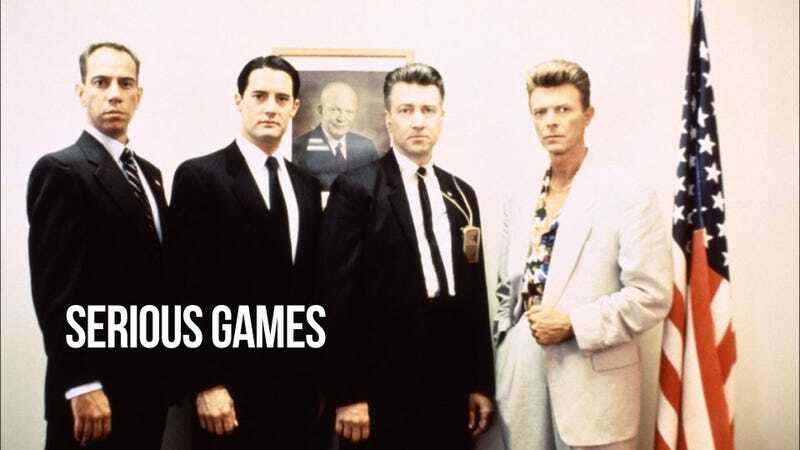 Aside from being engaging, which is one of the key elements to teaching someone anything, Pargman says that the games the FBI creates for training need to be fun. "When we're pitching the idea of fun to people who don't necessarily think about it, their reaction is always negative," he says. "They think fun is a waste of time, but that's really not true. The way I've argued this, and it seems quite effective, is this: it is apparent to most people who are involved in training that an excellent way to learn is by repeating the desired action over and over again until it becomes second nature. "Here's the problem: when you think of little kids, they're just programmed to do it, they love repetition, but as adults we don't. Games are the perfect medium for exploring repetition in a way that people want to. How often do you play Super Mario Bros. and do the same levels over and over and over? Because of the good game design, every single game that you've played and enjoyed you have probably done the same series of actions repetitively. "So if we can have people voluntarily do something over and over doing it better and better and we can give them feedback and they're naturally motivated to keep doing it, they're going to learn and get better. And that's true for a lot of other things." By the end of the talk, the audience that had initially perched nervously in their seats with the FBI sweats has relaxed. Pargman seems no different to any other the other game developers giving talks at game conferences. He's funny, engaging and, mostly important for this audience, he knows his games and he knows them well. He might be armed and have all our personal details on his super secret special agent database, but it's a relief to know that even at a place as serious as the FBI, there is still room for fun and games. Tracey Lien writes for Kotaku Australia. You can follow her on Twitter!